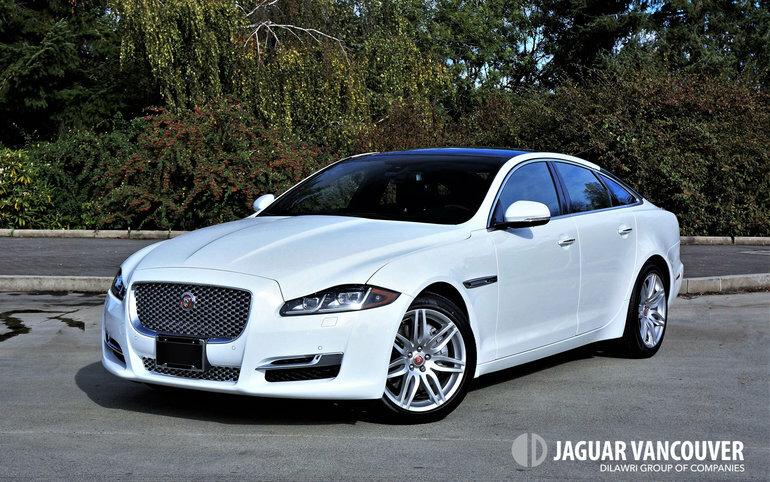 Jaguar updated its full-size XJ flagship sedan last year, and the result remains an even more attractive version of the long, elegant four-door luxury model than before. My 2017 XJ Portfolio AWD trimmed tester was finished in Fuji White, this light shade offsetting its black glass roof and black rear pillars perfectly. Jaguar finishes off the rear bumper with a glossy black diffuser-like design featuring a bit of chrome on top and two polished stainless oval tailpipes at each corner. It’s a stunning look, trimmed off with gracefully arcing LED taillights in back and sharply dressed full LED headlamps up front. The latter were added as part of the 2016 model year redesign, as was a larger front grille, a new front bumper, a reworked lower front fascia, plus those oval tailpipes in back. Depending on trim there’s some lovely bright metal detailing up front, while the equally dazzling front fender vents are carryover. The brilliant set of twinned seven-spoke 19-inch alloys on 245/45 front and 275/40 rear Pirelli P-Zero Nero performance tires are new this year, a sporting yet elegant $540 option that visually underscores the entire car. The XJ looks sensational from front to back, and is easily my favourite full-size sedan in this premium class, at least until moving up into the ultra-premium sector where Bentley wins my vote with the Flying Spur. Fine company indeed, the same being true for the XJ interior, which in as-tested Portfolio trim comes standard with the most beautiful quilted leather upholstery this side of that more substantive Brit. Mine was in standard Ebony black, with Gloss Figured Ebony (a striped brown and black hardwood) inlays surrounding. Alternatively you can dress up the hides and interior motif with a variety of two-tone colour combinations for no charge, including a Cashew and Truffle (beige and milk chocolate) combination, Ivory and Ebony (an ode to Sir McCartney and Mr. Wonder? ), London Tan (more of a caramel brown) and Ebony, or Ivory and Mineral (medium-grey), whereas you can swap out the aforementioned Ebony wood with no-cost Gloss Burl Walnut (for a more traditional look), Piano Black lacquer, or opt for $1,640 worth of Carbon Fibre. Take note, my tester’s heatable wood and leather rimmed steering wheel was a $570 option, but certainly money well spent, while its various metal details, much of which featured knurled edging for jewel-like brilliance as well as easy grip even while wearing winter gloves, come standard. Of course, any brand can fill a car up with leather, woods, metals and every other assortment of luxury trimmings, the differentiators made by genuine premium brands being the way all of it comes together, Jaguar displaying decades of artisan skill in every inch of the XJ’s cabin, and more importantly how the marque’s rich heritage exudes in design and inherent DNA. The brand's history goes all the way back to 1935 when then S.S. Cars introduced the Jaguar 100 open two-seat sports model, the Swallow Sidecar Company having produced for the motorcycle industry before that. The firm became Jaguar Cars Limited via a simple name change in 1945, enjoyed rare success with numerous iconic road cars as well as legendary track victories, and the rest, as they say, is history. Along with that heritage is modern-day beauty in both design and engineering. The XJ is uncommonly attractive and one of the only luxury sedans made mostly from lightweight aluminum. In fact, it’s the full-size luxury car segment’s lightest entry, a performance and efficiency advantage that increases commensurately when comparing long-wheelbase models. Ask anyone in motorsport, the main culprit to performance is weight. Therefore, it’s no wonder the XJ feels agile when pushed through fast-paced curves that might unsettle one of its heftier competitors, its mostly riveted aluminum body structure wonderfully rigid too. Pop open the ultra-light hood and some of its alloy castings become apparent, particularly the strut tower braces, these stiffer than if moulded from pressed steel, while the adaptive air suspension they support is hardly lacking in sophistication, aiding the car’s near equally balanced front-to-rear weight distribution with superb responsiveness and a blissful ride, even over rough pavement. There’s environmental reasoning on the side too, the XJ made from 50 percent recycled aluminum that’s more easily recyclable in later years too, while its lighter weight makes for good fuel-efficiency considering the class, its claimed five-cycle rating being 14.0 L/100km city, 9.0 highway and 11.8 combined as-tested. This would be with the base 3.0-litre supercharged V6, good for 340 horsepower and 332 lb-ft of torque pushed down to all four wheels via a ZF-sourced eight-speed automatic transmission. The latter is a wonderfully sorted gearbox that provides as much luxury sedan smoothness when driver-selectable JaguarDrive Control mode is set to default mode, which engages auto stop/start to shut off the engine when it would otherwise be idling, or winter mode that reduces wheel spin off the line, as it produces short, snappy paddle-actuated shifts when set to its most entertaining Dynamic sport mode. Its torque vectoring AWD comes into play no matter which mode is chosen, the advanced system utilizing a version of Land Rover’s Terrain Response system, dubbed All Surface Progress Control (ASPC), for overcoming slippery road surfaces. In ideal conditions the XJ Portfolio AWD can charge from standstill to 100km/h in just 6.4 seconds and then on to a top speed of 195 km/h, while I should also mention the supercharged V8 XJR can manage the same feat in only 4.6 seconds before reaching a terminal velocity of 280 km/h thanks to 550 horsepower and 502 lb-ft of torque under hood. Speaking this way makes the XJ seem like some sort of F-Type inspired super sedan, and while it’s as performance-oriented as luxury four-doors come, with the added enjoyment of inspiring exhaust notes at full throttle, don’t think for a second it’s not fully capable of pampering all occupants with the previously noted luxurious surroundings, plentiful accommodations, serenely quiet ambience, and premium accoutrements. Standard features with $92,000 R-Sport trim include a different set of 19-inch alloys, full LED headlamps with adaptive cornering and auto high beams, power-folding side mirror housings, auto-dimming mirrors all-round, proximity access with pushbutton start, soft door close, an electromechanical parking brake, rain-sensing wipers, a power-adjustable steering column, a heatable leather-wrapped steering wheel, a 12.3-inch LCD primary instrument cluster, three-way heated and chilled front seats, 10-way powered front seats with three-way memory, leather upholstery, gloss burl walnut veneer, dual-zone auto HVAC, a garage door opener, a full-colour InControl Touch Pro touchscreen with navigation, a rearview camera with dynamic guidelines, 18-speaker 825-watt Meridian Surround audio, satellite and HD radio, Bluetooth audio streaming, a panoramic glass roof with a powered sunshade, a powered trunk lid, blindspot warning with fast-object detection and rear cross-traffic alert, all the expected active and passive safety features, and much more. Of note, the XJ’s fully configurable gauge cluster can now incorporate full infotainment functions within its mid-mounted multi-information display, such as navigation mapping, while the InControl infotainment touchscreen over on the centre stack, which was starting to lag behind rivals when it came to responsiveness, is also improved for 2017. The system’s backend gets a new processor, graphics card, and solid-state hard drive, while the touchscreen allows smartphone and tablet-style swipe and pinch capability along with the usual tap gestures. Portfolio trim, which starts at $96,000, adds unique 19-inch alloys, the gorgeous diamond-stitched quilted leather upholstery noted earlier, comfortable 14-way power-adjustable front seats with four-way lumbar support and relaxing massage action, heated and cooled rear seats, four-zone auto climate control with rear controls, sensational 20-speaker Meridian audio, illuminated vanity mirrors for rear passengers, soft suede-like microfibre roof pillars and roofliner, Jaguar even finishing the dual panel panoramic sunroof’s powered sunshade off with the same ultra-plush material, plus more. I’m not going to give you a rundown on all available options, but you may want to upgrade the audio to a 1,300-watt, 26-speaker Meridian system, while long-wheelbase versions can be had with rear entertainment featuring twin 10.2-inch monitors capable of receiving content streamed from smartphones, tablets, or laptops, plus DVDs of course. Everything covered thus far puts the XJ in impressive light, but its value proposition makes it even more enticing. Compare it to most rivals and you’ll find its aforementioned $96k as-tested price and equally reasonable $92k base price are tens of thousands less than most equivalently equipped German competitors, making the XJ a very sensible way to get a good luxury car deal without sacrificing quality, performance or prestige.